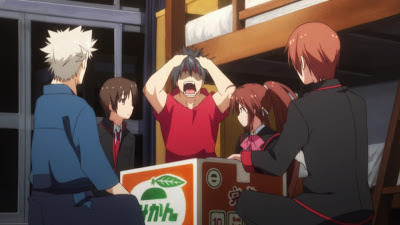 Summary: A group of five friends, call themselves "Little Busters", looking for something to do in order to have a memoriable final year of high school. First impression score: 84 - Um...Sket Dance?! Personal comments: Though it's a completely topic, it's giving me a very similar vibe as Sket Dance did. The randomness the style of comedy which literally tries to make fun of anything comes around the corner feels just like how Sket Dance does it. Personally, I was quite fond of Sket Dance, so this has gained my interest...at least for now.